Just one thing, NVidia inspector helps a lot! Well, what does Highmemfix, it is essencial? Now with FSX stock cfg I can obtain around 40-50 fps at AXE cockpit, with scenery sliders to right, should I put Highmemfix? 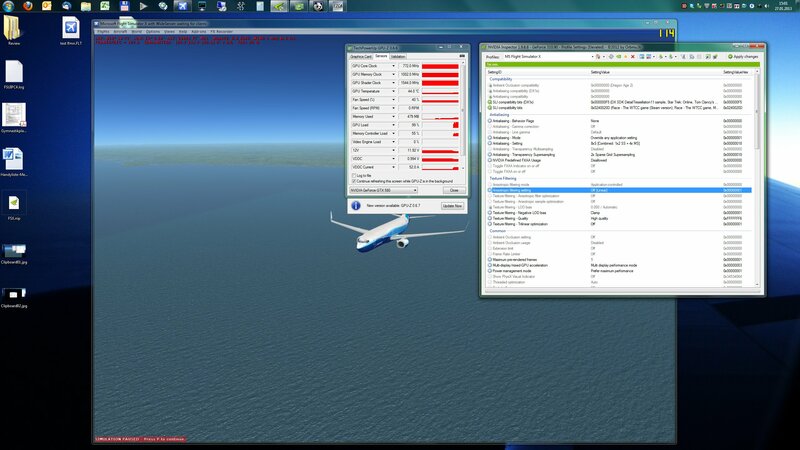 The highmemfix allows FSX to manage more then 512MB video ram. So it is a "essential" tweak. Will test and give a feedback. HIGHMEMFIX=1 works well. It's a "magic" tweak. Your CPU is a quadcore without hyper threading, so you might want to try an affinity mask of 14, which will effectively switch off core 0, freeing it up for fibers. I use in-game anisotropic filtering, inspector settings for antialiasing, and am playing with 2xSGSS, which helps to remove shimmering. The performance loss of 4xSGSS is not worth the image quality gain in my opinion, but you should see what you get. I have the i7-2700K running at 4.8GHz currently. Now it's fine with NVidia Inspector settings. Many people said me to put a I5 3570K, and leave I7 3770K, because would be waste of money. This thread is now taking a direction that it seems best to move it to a more appropriate forum. As the second line says under the General Forum, it's NOT for support. Well, I've a little thing. The autogen loading is a little slow. Loads one part, then other, slowly, slowly. Any tweak for this? W7 isn't fully compatible with FSX. Vista 32bit was. So you need this older dll to place it in your FSX root folder. It'll be used by FSX only; all your other applications will use the default W7 dll. "This issue may be caused by the default Windows 7 uiautomationcore.dll file, which resides in the Windows system folder and is involved in view switching and menu use. As long as the dll file is in the FSX root folder it will use this version instead of the Windows system folder one." So in my W7 64 bit, I've to put this UIAutomationCore.dll into mt fsx root folder? Can you send a trust link to download this one? See my enhanced post above. Link is from PMDG support. EDIT: Yes this don't work, I've to take an .dll of a 64 bit W Vista. And this one is of 32 bit. Your W7 dll will work most of the time. But sooner or later your FSX will freeze with only sound playing. No key strokes will work anymore. You need to restart FSX. The other dll is needed to prevent this. Vista 32bit is fine, since FSX is a 32bit application anyway. Just put it into your FSX root folder, so that no other application will use it (they use the original W7 dll). You may compare my statements to the AVSIM hardware FSX guide: They state the same as PMDG. 3. should read "cfg", of course. And don't have any ground add-on. Using nvidia inspector and highmemfix=1. I tried lot of things, but no results. Maybe drivers problem? I'm using v314.07 of nvidia. Is it default FSX autogen buildings doing the flashing? And is it happening while far away but not close up, or both far away and close up? Yes, FSX autogen buildings, with gate number plaque and with AES dock system, only far away. Two things to consider then. If you have "Ground scenery casts shadows" on in your FSX settings, try turning that off, and see if it helps. Secondly, are you using anti-aliasing/anisotropic filtering through FSX, or through something like Nvidia Inspector? Try using the regular FSX AA/AF and see if that helps.